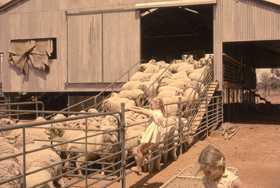 Did your ancestry own sheep in Queensland? This publication is a wonderful genealogy tool. It indexes the 17,151 entries appearing in the annual lists, published in the Queensland Government Gazette, of brand registrations from 1877 to 1900 (except 1884 and 1891-94). It also lists the brand and description, run or farm where brand is to be used, nearest post town, date brand listed and page reference in the relevant Queensland Government Gazette. Where it has not been possible to reproduce the brand, a description of it is usually included under the description and position field - for example, bell, anchor, pine-tree, horse-shoe, wine-glass, spy-glass, wheel. There are, however, some brands for which no simple description applies. The original lists will need to be consulted to see these brands. No lists are available for 1884 or 1891-1894. From 1895, and in accordance with The Diseases in Sheep Act Amendment Act of 1890 and The Diseases in Sheep Acts, the lists followed a different format. No reproductions or descriptions of the brands are included in the database for this period. Brand: Any legible firebrand permanently impressed on the nose face or horn OR any brand permanently impressed by means of Indian or other ink on the ear OR any pitch paint or tar brand impressed on the wool or any portion of the body of the sheep. Nothing in the Act prevented any owner of sheep from using distinguishing brands in addition to the registered brand. Age: All sheep above the age of six months were to be branded with a brand which had been duly registered. Letters: No owner or other person could brand sheep with either of the letters S T N and C except for the purposes named in The Diseases in Sheep Act of 1867. Annual List: Annual lists of brands were to be published in the Government Gazette as soon as possible after the first day of January together with the names and addresses of the owners.